To watch videos on book and cooking demonstration, please visit www.ahbonbon.com . Worldly Home Cooking is the key to health and fitness. 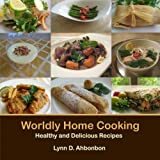 It contains delicious traditional international recipes that Lynn Ahbonbon has modified to be healthier, tastier, and easier to prepare. Each recipe includes interesting cultural background information about the dish as well as the nutritional benefits. This book combines selective recipes from Ahbonbon’s two other books, Food Made at Home and Success Begins at Home, for those who would like to have a stand-alone recipe section without the healthy living or entrepreneurship. Lynn D. Ahbonbon has traveled the world and lived in France, Germany, South Korea, Vietnam, and the United States. Her passion has been cooking and inventing new healthy recipes since she was ten. She graduated from the University of Southern California (USC) with a B.S. and M.B.A., and held several positions at a large automotive corporation before becoming president of an economic development corporation, providing education in entrepreneurship and healthy living to small businesses for 15 years. After being faced with three young relatives who had cancer, Ahbonbon now has a clear mission: To help people live a healthy life and achieve their financial dream by publishing entrepreneurship, healthy living, and food guides.